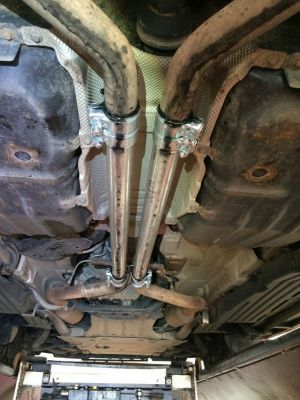 RRSPORT.CO.UK • View topic - Where do i buy exhaust mod? Home > Maintenance & Modifications > Where do i buy exhaust mod? Just the second box (big square one) not both of them. Never heard a diesel with it done but can not imagine its sounds as good as the S/C. I will try and film the sound at some point. I did not remove both as i think the first oval box is just to balance the gasses so best to leave it in. So Andy removing the to boxes on yours has been ok. as i like the rasp yours has. V8 is the only way to go.This is what mine sounds like with the middle box & resonator removed. Love that rasp, are you going to get a remap done to take advantage of the modified exhaust? Awesome sounding exhaust, how does it sound on the motorway at constant speed? Has anyone done this to a 4.4 V8? I'm going under the knife next Wednesday! Once you get upto speed it’s ok,it’s only on acceleration that’s it’s loud. Is there any cross over in your exhaust ie an X or H or are both pipes completely separate from manifold to tailpipe? Is the idle funny sounding? Both straight pipes from manifold to back boxes,,it ticks over ok. Went into muffler shop and after some discussion we just went with the removal of the resonator and I’m very happy with the results. It’s not quite as loud as Andy’s has a nice deep rumble, no real drone (haven’t been on a long trip yet) and I do get some pops and bangs on deceleration in sport which I really like! Muffler guy really liked it too, said it didn’t sound cheap! The guy at the muffler shop suggested I’d be too loud and to try just taking out the resonator and see if I liked it. I do, it’s a nice deep rumble sounds mean but gets a couple rasps and pops, totally different to stock! I tried to put a video on here but haven’t figured that out yet. PM me your email and I’ll send it to you. Could you email me the clip too please? I know mine is s/c but it should sound similar Steve. Lose the X or H pipe and lose BHP. What about the vehicles with V engines that just have a exhaust pipe on each side of vehicle.